WiseStamp helps you maintain a well-designed, professional and dynamic email signature with templates, modules, and apps that can, for instance, insert your latest tweet. WiseStamp's editor is a bit limited, though, and the most exciting features only work with certain email services and browsers. Browser add-ons make WiseStamp work with Gmail, Yahoo! Mail and other web-based emails. WiseStamp helps you maintain one or more email signatures. Using one of many templates, you can create signatures just to your liking with the rich web-based editor. WiseStamp has fields for all your contact details, including company and job title, phone number, website and WhatsApp, for instance. You can add a photo or company logo as well, and buttons connect to social media. ”Apps” let you add further items such as banners, sales messages (from your online shop) or quotes. Possibly most interesting are dynamic items that insert the latest tweet, Etsy store items, Facebook status updates, eBay items or photos from Instagram, for example. You can also add custom HTML code to your WiseStamp signature. Paying users get more templates and can set up more than one signature; for each address, they can specify a different default for replies and forwards. WiseStamp offers plug-ins for Google Chrome, Safari and Firefox for automatic signature management in Gmail (including Google Apps and Inbox by Gmail), Outlook.com and Yahoo! Mail. Free accounts include a WiseStamp promotion at the end of each signature. WiseStamp's template system accomplishes another goal elegantly, though: all the essential information is bound to be in your signature. 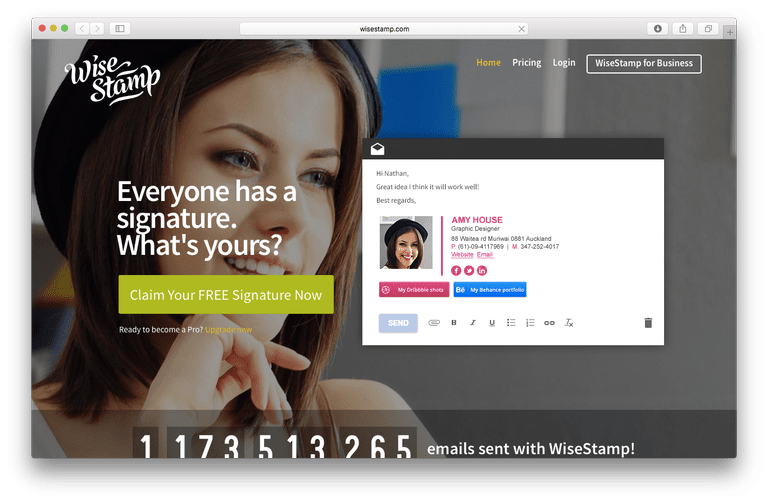 You're trying different designs and playing with their formatting is not the only thing that is dynamic about WiseStamp signatures; possibly the most enticing tool WiseStamp offers are its “apps” for including more than the basic information in your signature. One way to use an email signature for more than just marking the end of a message (and possibly the most effective one) is including not a link to your website or blog or Twitter account—but the latest tweet itself, a link to a current blog post (with teaser) or the latest feature on YouTube. Effective? How effective is changing your signature every few days, and in all the places and apps you use to send mail? This is where WiseStamp can (or could) shine: in addition to the standard information and links to social profiles, WiseStamp also lets you add "apps" to your signature. These pull information from a blog, Twitter account or store on the web and include it in the signature dynamically. Recipients get a fresh—and effective—experience, and you have to include the app once, then not lift a finger. Examples of dynamic signature modules also include Instagram photos, Medium articles, eBay offerings and, as a welcome throwback to the times of /usr/games/fortune, random quotations. If you use WiseStamp with a supported web-based email account (such as Gmail, Yahoo! Mail and Outlook.com) in a supported browser (such as Google Chrome), practice much follows theory: you compose your signature in the WiseStamp editor on the web, and the plug-ins take care of the rest, setting up and maintaining your sig including images, dynamic content and all. This is not entirely WiseStamp's fault, of course, but worth keeping in mind. It is also worth noting that, even with fully supported email setups, WiseStamp's free version will maintain only one signature; subscribers can create multiple signatures for their various email personas—and have WiseStamp pick one automatically based on the address used for sending.